ChatOnGo is the best live chat software, it is an enterprise social network tool that helps in employee’s engagement & team collaboration. The offered solution for business is the best way to communicate inside the business organization. The corporate chat app lets you do more than any other chat app in the market. The perfect solution to organizational communication problems. ChatOnGo is an online IM service, which is available as a website and an android app, for people to converse with each other. ChatOnGo is used for multiple purposes, including business, anime, roleplaying, and other topics. It is free to make an account, easy to embed and customize, can handle traffic spikes, works on phones and tablets, and many chat rooms are family friendly. The data that is collected through smart messages can be assembled. All at one place to generate metrics of the information collected. It can give you even the collated reports for any period since the origin of that message in case of scheduled messages. This allows you to see the variation in data in the past. This data can be used to predict the data for future. Hence, making it easier for you to design a business strategy. Do messages relevant to you get lost in the clutter? ChatOnGo for Business has the solution for that too. All you need to do is search for posts with a keyword that might be relevant to you. Say, you work for a software company and your role revolves around clearing bugs out of the app. So, you search for bugs or type the name of the software to find messages relevant to you. You get exactly what you are looking for, doing away with the clutter. Now say bye to communication gaps and information leakages! ChatOnGo for Business lets you make different groups for different purposes. And it is just like on social media. But here is the twist! There is no limit on the number of members in a group. Moreover, only a select few control the privacy of the group. They control who to add from a group and who can view what information. Sounds interesting, right? There is more. This amazing feature of the team collaboration tool segregates information about a team or a department (or whatever classification you please). Moreover, these groups are air-tight. Tired of your screen filling up with tonnes of messages that make no sense? ChatonGo for Business will go to all lengths just to make sure that your work life is clutter free. When you type a message, you can tag your post to a category. Tag Category option is there to ensure you get relevant messages in instances where searching keywords fail. The newsfeed is designed to make the information flow in an effective manner. It is very likely to miss out on important information because of the clutter. ChatOnGo for Business takes on the challenge and makes business communication more efficient. Going to each and every group you are a part of to check for updates? Newsfeed is here to ease the task. When you open the app, you see all the posts from all the groups at one go. We understand the need and importance of getting your data at the right time in the right way. ChatOnGo for Business’ task management feature lets you assign tasks to your subordinates and track them to meet deadlines. Additionally, you can keep track of tasks completed or delayed. This feature will not only let you keep a track of the employees. You will not only get to know who works hard to meet deadlines but also to identify the ones who slack off. ChatOnGo for Business makes sure your communication platform is safe and secure. The Enterprise social network ensures that information leakages are prevented at all costs. That is why it gives you all the control; because who can know what to protect from whom better than you! This corporate chat app will truly surprise you with the potential it has. Smart Message is that revolutionary feature in the ChatOnGo app that would make communication gaps a thing of past. ChatOnGo gives you a smart tool to engage the whole team for collecting information in an effective manner. The smart message lets you conduct polls and collect data in any form that you please to. All because of its multiple options designed for the purpose. Consequently, you get data on real time basis sans any delay. In addition, the app lets you generate reports instantly on the data you collect. Isn’t it amazing? This team collaboration tool won’t cease to surprise you (pleasantly, of course!). 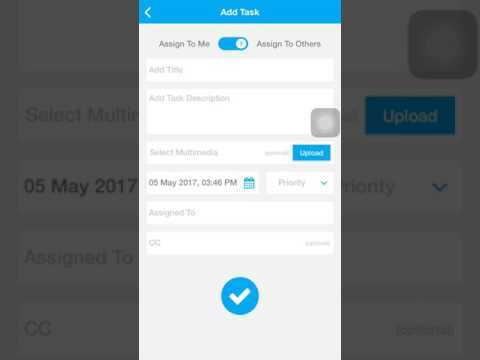 This video gives details steps on how you can assign tasks to others as well as to yourself. You can also able to comment on task of which you are part of. Thus all the people involved inside that task knows exactly what are roadblocks and status of task. It also shows how to filter to get various permutations and combination list of tasks.